[SatNews] Lockheed Martin (NYSE: LMT) has completed Intersegment System Testing (IST) of the second Advanced Extremely High Frequency (AEHF) military communications satellite at the company's facilities in Sunnyvale, Calif. This critical milestone marks the completion of pre-launch verification for the new eXtended Data Rate (XDR) service which will provide substantial enhancements in the capacity, coverage and connectivity of protected communications for warfighters around the globe. AEHF is the successor to the existing five-satellite Milstar constellation and will provide global, highly secure, protected, survivable communications for warfighters operating on ground, sea and air platforms. Completion of IST for the second AEHF satellite marks the culmination of an extensive suite of interoperability tests with new XDR capable user terminals demonstrating protected anti-jam communications at data rates up to 8 Mbps via highly agile satellite spot beams. New and enhanced strategic and tactical applications such as real-time video and voice and data conferencing will be enabled by this XDR service providing a ten-fold increase in system capacity, coverage and network connectivity. Col. Michael Sarchet, commander of the Protected Satellite Communications Group at the U.S. Air Force's Space and Missile Systems Center said, "This major milestone represents completion of our single-line flow activities and moves the program another critical step closer to the full deployment of the AEHF system and delivery of unprecedented protected communication capabilities to the warfighter." The second AEHF satellite has completed all testing and will be placed in storage next month. 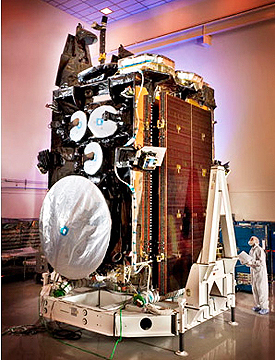 The third AEHF satellite is progressing through thermal vacuum environmental testing at the Lockheed Martin facility in Sunnyvale, Calif. The AEHF team is led by the U.S. Air Force Military Satellite Communications Systems Wing at the Space and Missile Systems Center, Los Angeles Air Force Base, Calif. Lockheed Martin Space Systems Company, Sunnyvale, Calif., is the AEHF prime contractor and system manager, with Northrop Grumman Aerospace Systems, Redondo Beach, Calif., as the satellite payload provider. Lockheed Martin is currently under contract to provide three AEHF satellites and the mission control segment to the U.S. Air Force. The program has also contracted advanced procurement of long-lead components for a fourth AEHF satellite. A contract award to begin full scale production of the fourth satellite is expected in late 2010.